When you ponder the joys of life, how long does it take you to think of the people in your life? Not long, I bet. Relationships are the very fabric of our existence. They have the potential to lift us up when we’re down, to bring us delights previously unbeknownst to us, and to help us experience the wonder of ourselves in another and in so doing, to unite us with the soul essence of who we are. Yet they can also be the source of much conflict and disappointment if we are disconnected from their true purpose and life-giving potential. 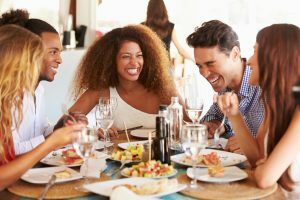 Here are 5 ways that you can instantly strengthen your relationships and reap the intimate rewards of a social connection gone right. 1. Communicate openly. The root of most suffering in relationships is either a lack of communication or poor communication. Practice honestly communicating your feelings, desires, questions, and concerns whenever possible. Without honest communication, trust is impossible to build and without trust, a healthy relationship is impossible to enjoy. Though being honest can sometimes be a difficult endeavor, the alternative is not a valid option if strengthening your relationships is your goal. So go on and face the fear of what might happen if you are honest about anything and everything that you truly feel in your heart. And be ready to experience a sense of freedom and closeness like never before. 2. Practice patience and presence. Be patient with others when in their company, whether on the phone, online, or in person. Know that everyone has their own rhythm of action, of speech, and of life. Rather than trying to hurry others to adjust to your pace of life, understand that the pace at which they learn, grow, act, and understand is perfect for who they are in this moment. Be patient with the relationship too. Know that it is always evolving into something more meaningful and that each moment, no matter how seemingly small – especially when approached with presence – is contributing to the type of relationship you wish to create. There is a vast difference between sharing mere physical presence with someone and sharing true, unbridled presence. I know you’ve felt it before. So why not go forward and share that gift with someone else too? 3. Release resentment. Be honest, firstly with yourself and secondly with anyone who was involved, about how you’ve felt in response to hurtful things that have transpired in the past. Then decide that you want to release the resentment. First ask yourself why you felt resentment in the first place. Did you feel let down? Did you have an expectation that wasn’t met? Did something the other person said or did rub you the wrong way? Whatever it is, remind yourself that everyone is always doing the best they can, that giving (for example, by doing a favor) with the expectation of something in return is a recipe for resentment and disappointment, and that your happiness is best not contingent on the actions of anybody else. Decide that this is the day you will release any resentment that has built up inside you, choose to be grateful for the lessons contained in what’s already occurred, and look forward to a strengthened relationship in the future that is not contingent on the past. 4. Share meals. Food is more than just sustenance. It’s an opportunity to bond with the ones you love. Invite the ones you love over to share a meal. And as you meander around the kitchen, remember that preparing food, and of course eating it too, is the perfect opportunity to create a shared experience that strengthens a relationship. Most of our memories center around good conversation and good food, which not surprisingly is the ideal formula by which to create positive shared experiences that you will remember and cherish for a long time to come. 5. Love unconditionally. In any moment you share with another person, strive to be present with them just as they are. No judgment. No evaluation. No trying to change them. Practice seeing them through the eyes of Source – as the perfect being that they are. Reflect to them, through your loving gaze and words, that all the things they may judge, be ashamed of, and wish were different in themselves, are in actuality a non-issue. Recognize that like you, they have human experiences that suggest otherwise, and that as a result, they need to be shown even more love. Practice empathy for their life experience. As you figuratively place yourself in the shoes of someone else’s emotional life experience, you will begin to understand why they are the way they are. As a result, any judgment you may have held about them, their choices, and behavior ceases to be. Stronger relationships equate to greater joy, greater fulfillment, and a deeper love of life. Choose just one person in your life with whom to practice the principles outlined in this article and let us know what ensues in the comments below!